Before anyone yells “Climate Change”, Reader, Pat, found stories about hail the size of Eggs in Sydney in November 1929. Hail the size of Tennis Balls fell on Reids Creek near Brisbane in 1934 and hail the size of Tea Cups fell on Brookville in 1902. Paddington had “ice inches deep” on Nov 1, 1931. There are scores more Hail-the-size-of… Maybe building 2 million solar panels on a continent with hail the size of tea cups was not such a good idea? 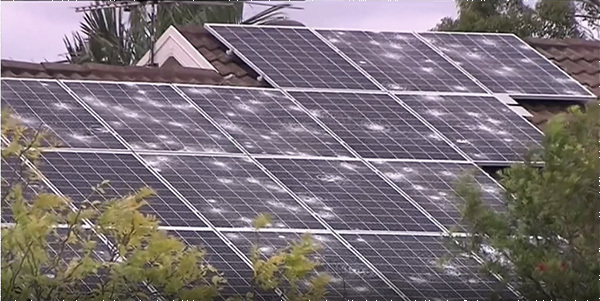 It’ also quite difficult to tell just how bad the solar panel-related storm damage has been, but judging by the size of these hail stones, what solar panel wouldn’t break? If anyone can take photos for us that would be great. From Twitter #SydneyStorm See the hail smashing into the water. Great Photography on Twitter.